Give your landscape a dramatic effect with patterned walls. Add a whole new dimension to your landscape! Blend the different sized blocks together into your wall and capture the look of hand-laid stone. Choose from one of our pre-set patterns to build your wall, or create your own. Walls with curves or requiring reinforcement must be constructed with a two course pattern. Patterned walls resemble hand-laid stone walls, and will require a certain level of detail and craftsmanship to construct. Some custom fitting of blocks will be required. Plan on taking a little extra time to build, particularly when building one for the first time. Both the AB Collection and AB Europa Collections can be used to create a variety of pre-set and random patterns. (See the Pattern Chart for more details). A pre-set pattern is repeated every two or three courses of block. A single course consists of a full size block, approximately 8 in. (200 mm) high. 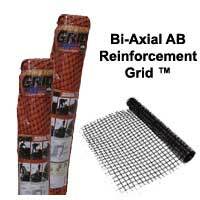 Random patterns used on a reinforced wall require a level surface every 2 courses for proper installation of geogrid. Check your approved plans for geogrid placement. Note: Walls with curves should always use the 2 course pattern to minimize cutting and fitting. For walls requiring geogrid use the 2 course pattern to allow for proper geogrid placement. 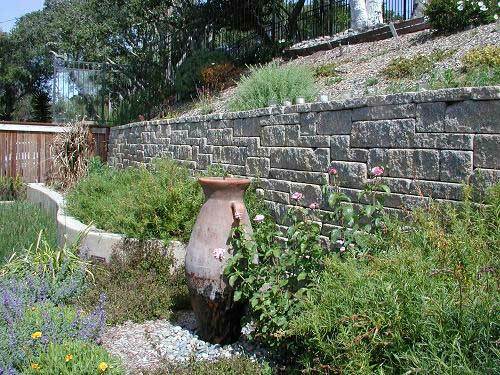 The base course of your patterned retaining wall should always be installed using a full course of full-sized blocks. This will speed the leveling and installation of the first course of the pattern. Refer to the basic retaining wall instructions for a detailed description on how to install the base course. Basic steps include: site prep and excavation, installing base material, base course, wall rock, backfill materials and compacting. Install the first layer of geogrid by placing the edge of the geogrid against the back of the raised front lip and rolling it out along the wall. 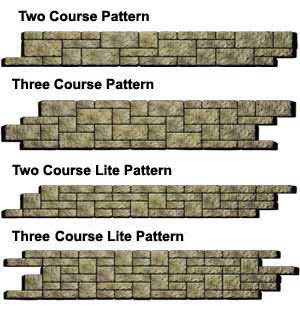 The retaining wall example shown here uses a two (2) course pattern. Stack the first course of the pattern on top of the geogrid and the base course. Check blocks for level, and make adjustments as needed. Pull on the back of the geogrid to remove any slack. If necessary, stake in place. Install the wall rock in the block cores and 12 in. (300 mm) behind the blocks to the height of the blocks. Compact inside the block cores using a shovel handle. Check blocks for level. Learn more about compaction in the block cores. Use infill or approved on-site soils to backfill behind the wall rock in 8 in. (200 mm) lifts or less. The top of the blocks will not always match up with each lift of soil. Check blocks for level. Using a plate compactor, compact the wall rock and infill materials behind the block in 8 in. (200 mm) lifts or less. Compact directly behind the blocks in a path parallel to the wall, working from the back of the wall to the back of the excavated area. Always make a minimum of two passes with a plate compactor. Install the remainder of the 2 course pattern. Install wall rock in the block cores and behind the blocks as before so they are level with the top course of the blocks. Use infill or approved on-soils to backfill behind wall rock. Check blocks for level. If using a custom pattern, remember to offset the vertical seams by at least 1/4 of the block whenever possible. With the first multiple-course pattern completed, use a plate compactor to compact the wall rock in the block cores and directly behind the blocks. The first pass of the plate compactor should be directly over the top of the block cores. Compact in a path parallel to the wall, working from the front of the block to the back of the excavated area. Make a minimum of two passes with a plate compactor. Check blocks for level. Keep all heavy equipment at least 3 ft.(0.9 m) away from the back of the wall. Refer to your approved plans to determine if reinforcement will be required. If so, repeat the previous process to install geogrid between the patterns. Install the next pattern section as done in the previous steps. Each additional pattern will need to be offset from the pattern below to avoid a repetitive look. Remember to offset the vertical seams by at least 1/4 of the block whenever possible. Two course patterns should be selected for most projects. 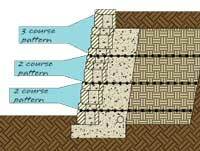 Three course patterns can be used for gravity walls or to top off a reinforced wall where geogrid is not required within the top three courses. Patterned walls may be ended with a step-down or a turn-in. When ending a patterned wall you will need to modify the pattern and randomly adjust as necessary to create the look desired. 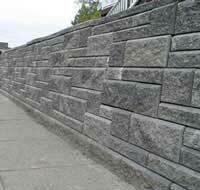 Finishing a patterned wall is the same as finishing a standard retaining wall. The only requirement is that a multiple course pattern must be completed so that the top course of blocks forms a level surface. Compaction in the block cores needs to be done regularly when working with patterned walls. This can be done by using the end of a shovel to compact the wall rock, adding additional rock if necessary. At each 8 in. (200 mm) lift, compact the block cores with the end of a shovel, and the area directly behind the block with a plate compactor. At the conclusion of each pattern, the top of the wall will be level. Run the plate compactor over the top of the blocks to consolidate the wall rock. Place geogrid if required, and begin the next pattern. 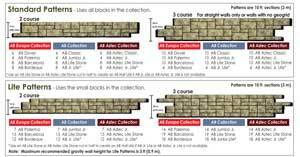 When building an AB Ashlar Blend retaining wall, if an AB Junior Lite is not available, the AB Lite Stones can be cut to produce two (2) AB Half Lites. It is good practice to pre-cut the desired number of blocks ahead of time to speed up the installation process. Offset each new pattern from the pattern below to maintain the "random" appearance. 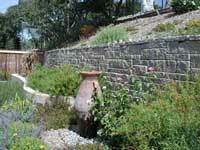 Use a two (2) course pattern on retaining walls that have numerous inside and outside curves. This will speed up the installation process. Use the two (2) course pattern when building a patterned curve. It is easier to work with than the three (3) course pattern. Learn how to build curves with this easy step-by-step process. To build tighter inside or outside curves learn how here.